◆The lack of global agreement could also make it hard to enforce ACTA in other countries where it has been approved but not yet ratified: these include Australia, Canada, Japan, South Korea, Morocco, New Zealand, Singapore and the U.S. 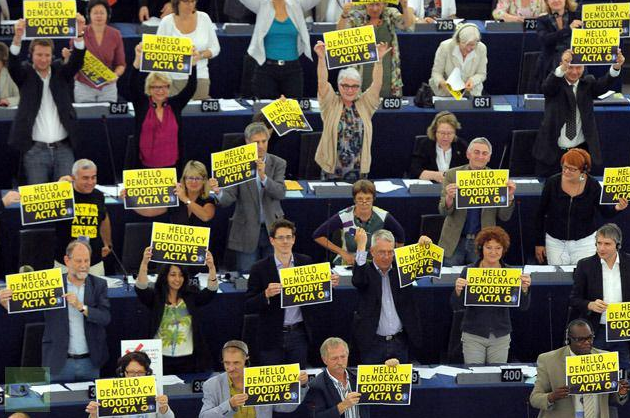 The European Parliment after voting no on ACTA. While the fear-mongers are trying to convince you the Planet is spiraling towards further oppression and destruction, we see a much different picture. ACTA, a proposed law that would have given corporations enormous power over the Internet, has been shot down by the European Union. This is wonderful news to all that support freedom and democracy! Are you going to build shelters or are you going to build windmills when the winds change? That was the question Rick Falkvinge, founder of the Swedish Pirate Party posed in his talk. There is a lot of misunderstanding in the debate around copyright. Rick addresses the fundamental issues in this debate and explains why we should worry about our civil liberties instead of keeping the copyright industry alive. As expected, the Anti-Counterfeiting Trade Agreement (ACTA), was rejected by the European Parliament today. An overwhelming majority voted against the treaty designed to establish international rules for cracking down on piracy and copyright infringement. Concerns raised over the agreement included a perceived lack of clarity and a window for misinterpretation that could jeopardize citizens’ rights. The Motion Picture Association was active in developing the treaty, but MPA Europe president, Chris Marcich, tells me that while the outcome is a disappointment for the studios, the result does not “substantively” change anything. “Certainly we’re disappointed with the vote, but I don’t think it was based on the treaty itself, it was based on politics and institutional issues. For Europe, ACTA didn’t mean any change at all in the current legal framework.” ACTA was negotiated by the EU and its member states along with the US, Australia, Canada, Japan, Mexico, Morocco, New Zealand, Singapore, South Korea and Switzerland. Thousands of EU citizens have protested the agreement fearing it would place limits on freedom of speech. The European Parliament also received a petition signed by 2.9M people worldwide calling for it to reject the agreement. ◆Happy Independence Day: SOPA’s Cousin ACTA Fails To Make The Vote In Europe, But Is This Really The End? A big day today for those who have been opposed to measures like SOPA that are aimed at stronger, government-imposed measures to define and prevent counterfeiting and copyright infringement on the internet: the European Parliament has rejected the Anti-Counterfeiting Trade Agreement (ACTA), by a nearly-unanimous margin of 478 votes against to 39 in favor. The rejection means that the European countries that have signed the treaty may have been overruled in putting it into ratified effect; and the lack of global agreement could also make it hard to enforce ACTA in other countries where it has been approved but not yet ratified: these include Australia, Canada, Japan, South Korea, Morocco, New Zealand, Singapore and the U.S.